I work at a local veterinary surgical specialty practice, and see many patients for post-operative rehabilitation. I send several of these patients to Pet Depot for swim therapy, and have had excellent results. My clients report that the pool is always clean, and the staff always friendly. I myself have used their self-service dog-wash in the past, and have never seen this designed in a better way, for the safety of the pet and client. I have also made use of obedience classes, the swim pool and made supply purchases at Pet Depot, without a shred of disappointment. 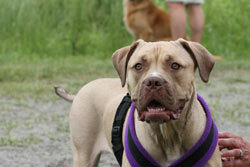 CieCie is a two-year-old Dogue de Bordeaux (French Mastiff) - Pit Bull mix. During the late winter and spring of 2010, she underwent three surgeries on her left hip - two attempts at total hip replacement and then the removal of all the THR hardware. With no structural hip joint remaining, and with the muscles in that leg terribly atrophied after months of enforced confinement, her left rear leg was a shriveled little thing. The physical therapist recommended swimming, and we began a regimen of lap swimming at Pet Depot. (And, once it got really hot during the summer, the pool was our only option for vigorous workout. After six weeks of three times weekly swim, the therapist and the surgeon were thrilled with CieCie's progress. We still hit the pool once or twice a week, and the leg just keeps getting stronger. I'm also taking my ten-year-old Lab-mix, Wonder, to the pool for water retrieves with a Chuck-It. He loves it, and it's easy on his aging joints. If you have further inquiries about the dog food, cat food, varieties of pet food we carry, call our pet supplies store at (410) 561-0931 or click here to contact us by email! Pet Depot is located in Timonium, Maryland and offers quality pet supplies, organic and holistic cat and dog food, self-serve dog washing stations, dog obedience training, and a state of the art dog hydrotherapy pool to pet owners in Baltimore County, Timonium, Baltimore, Towson, Cockeysville, Hunt Valley, Roland Park, Reisterstown and surrounding regions.